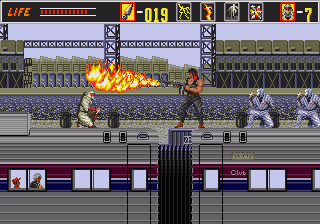 First of all, Revenge of Shinobi is easily the best game of the Genesis’ first year. Second, it’s easily one of the best games in the system’s entire library. While Sonic understandably gets the credit for showing off the best of the Genesis’ capabilities and turning the system from a competitor into a world-beater, if anyone had been paying attention there was already Revenge of Shinobi. 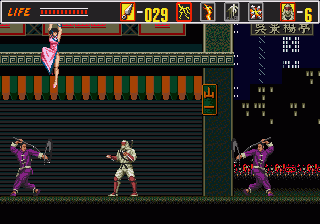 Revenge of Shinobi is the kind of game you’d see being played at your friend’s house – the one whose parents were frickin’ loaded – and wonder what the hell you were doing messing around with this bush league Nintendo stuff. That’s not to say there aren’t arguably better games yet to come out on the NES, that’s beside the point; Revenge of Shinobi was just a shockingly good, incredibly polished, beautiful game that constituted the windmill gutpunch of the Sega Genesis’ opening flurry, one that could make even someone lukewarm on Sega’s arcade ports sit up and take notice. My own experience until recently, when I was asked to write this piece, was seeing Revenge of Shinobi in the game magazines of the time. As a late adopter of the NES, an upgrade from the limp offerings of the Sega Master System, I was very, very happy with Nintendo’s machine. But though I professed my undying fealty at the shrine of the gray toaster, I couldn’t help feeling a twinge of curiosity on seeing the shots of the sixteen-bit games in print. Revenge of Shinobi, in particular, was an eye-popper. Even in the postage stamp sized shots, blurred and artifacted from late-eighties screen capture technology, the level of detail and colour was so above and beyond anything else out there, even if you couldn’t tell exactly what was so detailed. The image of the Zeed fight – the last boss – stands out in my memory even today; that giant shock of hair being flung across the screen, meticulously detailed and shaded; I couldn’t tell what it even was but I knew it looked cool as anything. 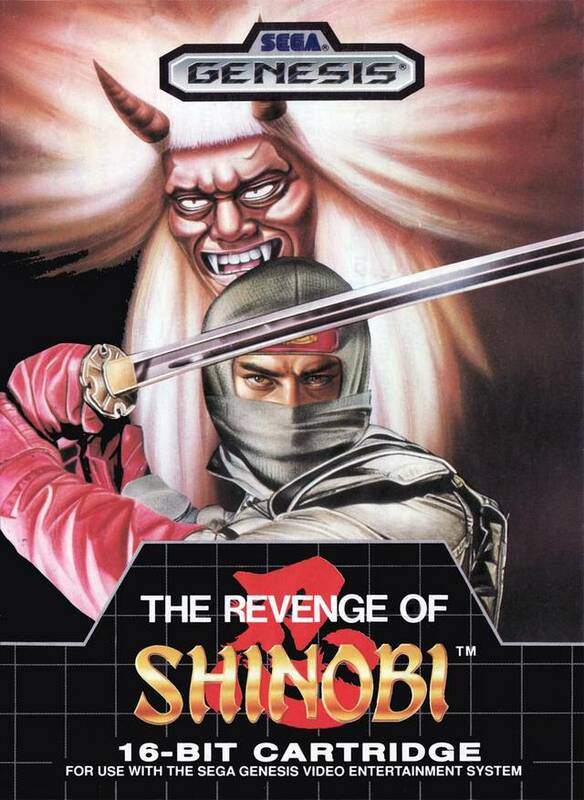 On researching this article, I have become utterly and completely infatuated with Revenge of Shinobi, considering it among the best action games I’ve ever played. But this is, oddly enough, a recent development. Even after emulators came around and I voraciously (illicitly) consumed the entire libraries of five or six different game platforms, I never did give Revenge of Shinobi a proper chance, though. Despite the memory of its impression on me as a child burned into my brain, I didn’t play it much past the first stage. I could see that it was a solid enough game, that much is obvious. But when you have the entire library of every pre-millennial video game console at your fingertips, it becomes easy to take games for granted if they don’t provide that rush of immediate gratification as soon as you turn it on. This is because Revenge of Shinobi is a slow burn. It’s methodical, it creeps along, it’s about carefully engaging in every encounter and engraving it into your memory. It is also a very hard game. Anyone expecting to be able to run through the first level and, like some kind of scene from Ninja Scroll, slicing through everything in your path and not even waiting for them to die before dashing forward and leaving rent, blood-spurting bodies in your wake, is going to be in for a rude shock. Enemies are tough, and comparatively smart. There are samurai who react to your positioning and raise their guard in whichever direction you attack from, there are ninja who switch up their shuriken tossing to hit you and then jump out of the way when you try to engage, and although there are tricks to deal with the entire roster of enemies quickly and efficiently, your first few games are generally marked with a swift and severe beating. Even tackling the very first boss, a giant, nigh-invulnerable samurai, is a trial which takes a not inconsiderable amount of finesse to figure out. If you stick it out past the initial slope of difficulty, you realize you can’t play this game like the swift, stealthy ninja you would imagine a game like this would play like. To make a comparison to film, this is less a quick, cheap ninja flick and more of a chanbara; less American Ninja, more Sanjuro. Taking each encounter one by one, observing the enemy’s attacks, and then quickly dispatching them when you see an opening. 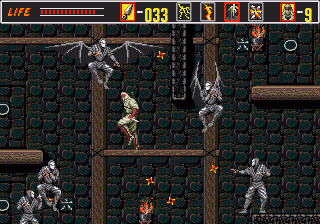 Unlike most of the Genesis’ hits thus far which had been adapted from arcade games – Ghouls & Ghosts, in particular – Revenge of Shinobi feels designed especially for the home console. It’s both as leisurely paced as you might like it, and offers you a number of concessions to your skill level. There’s no ominous timer above you forcing you forward, you move at a walking pace, and with the difficulty settings that serve to increase the number of lives you start with, you’re given more than enough chances to make it through to either win the game or quit in frustration. The ninja magic you’re given is relatively plentiful, giving you one shot at the beginning of each level plus offering you bonus pickups along the way. Between the spell that lets you take four hits without taking damage or flinching, and the spell which causes you to explode, damage the enemies, then reassemble with full health and one less life, this magic, used judiciously, can help even a fairly mediocre player make it through to the end. Used judiciously, and not like a total idiot, I should say. You’ll feel like a total chump for using the ninja magic, though, if you’re anything like me. The pace further is reflected in your moveset. Your primary attack is throwing kunai, but you’re given a limited number. When you get up close to an enemy or otherwise run out of kunai, you can engage with a short knife attack (or a kick if you’re crouching). You can also double jump, and attacking while double jumping will shower the enemy with a spread of kunai. This spread of kunai becomes increasingly more vital as you progress in the game; however, this uses up your precious supply like they were going rotten. Each group of enemies you run into requires a careful assessment of your capabilities – can you deal with them with your kunai, are you going to have to hit them with a flurry of kunai so they can’t get a shot off before you land, can you get close enough to engage with a melee attack? There’s also a power-up item which turns your kunai into powerful fireballs, changes your puny knife attack into a full-fledged sword slash, and allows you to block projectiles simply by moving forward. This power-up will make you much, much more survivable, but being hit once will cause you to lose the power-up. This is almost a mini-game in of itself, one that seems to be directly descended from the original Shinobi (single-hit Rolling Thunder clone that it was) in figuring out how to make it through the stages with your power-up intact so that you can easily take out the bosses. But it isn’t as if the game doesn’t make the struggle worthwhile. 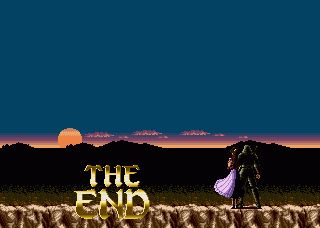 Revenge of Shinobi is gorgeous, varied, and has one of the best soundtracks on the Genesis, period. This is the game that put Yuzo Koshiro on the map for a lot of us out there, and it’s not just that he was the most canny composer in gamedom at that time (managing to fanangle a titlescreen credit). Koshiro, who proves time and time again to be possibly the most versatile Japanese game composer out there, provides a soundtrack that would have sounded ultra-modern and hip in 1989 and is still bangin’ as all get-out in 2011. A mix of traditional japanese instrumentals, house, jazz, funk, and heavy metal, brought to bear with Koshiro’s typically excellent FM programming. Probably best known is the boss track, Terrible Beat, a rocking hard techno track that gets your blood pumping for boss bustin’, but literally every other track on the soundtrack is fantastic. From the unforgettable first stage jam “The Shinobi”, a Japanese-flavoured house track with an incredible beat, or Ninja Step, an industrial dance banger perfect for the factory stages it illuminates, to “The Dark City”, a smooth, jazzy joint that nevertheless keeps the driving momentum of the soundtrack going strong. 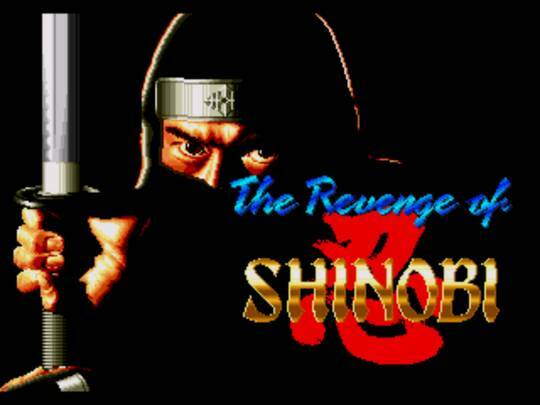 There are shades of Koshiro’s later Streets of Rage soundtracks here, with their contemporary electronic sensibilities, but Revenge of Shinobi still stands tall on its own merits. Coupled with a soundtrack that never lets up, neither does the game itself – as you inexplicably travel from Japan to the US, to Detroit and then back to California, and finally to New York City to take down the evil Neo-Zeed Organization, there’s scarcely a level which doesn’t have some new trick. In one level you find yourself jumping between a freeway and the catwalk outside, attempting to avoid this one persistent red Honda trying to run you down while at the same time evading ninja women leaping from inconspicuous nun habits, in another you jump from log-to-log across a waterfall; there’s a speeding train, an airship with doors that randomly swing open to spit you out, and, perhaps most infamously, a labyrinth of doors at the end. 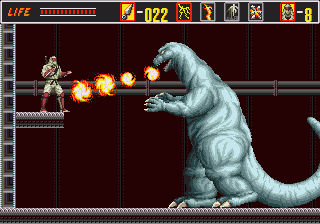 From these stages, you meet with the bosses – and yes, this game is notorious for its rather cavalier attitude toward other people’s copyrights, with you, depending on the ROM version, fighting Spiderman, Batman, Devilman, Godzilla, and even some kind of canonically problematic fusion of The Incredible Hulk and The Terminator. There are some standouts – the Spiderman/Batman fight for sure, and not just for its jaw-dropping lack of propriety; the gigantic Godzilla fight; the rock-hard final battle against Zeed (who is apparently Kabuki: Quantum Fighter’s bad apple cousin) who relentlessly tosses his obnoxiously accurate and incredibly dude-ruining hair at you, as the ceiling drops on your girlfriend all the while. There are some duds as well – the super-computer in the airship stage that takes ages to kill unless you’re really brave/foolish, and the simple and unimpressive battle against flashing red nodes on a speeding truck carrying a nuke – but all in all, it’s never boring. So yes, I’ve been positively gushing about it for paragraphs now, seeing as I am quite taken with the game. Is there anything wrong with it, though? Of course, it’s not perfect. It’s an early Sega Genesis game, and it’s missing some of the niceties that people come to expect from games these days. 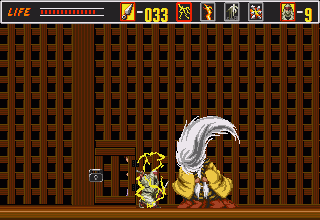 The game really likes throwing you off ledges into pits, causing instant death – not so bad in of itself, if you could see it coming, but Revenge of Shinobi really, really likes to use the Genesis’ vastly improved memory capabilities over the eight-bit generation to hit you with attacks from offscreen enemies. In almost all cases, these unseen attacks are precisely designed to knock you into a pit making, on most levels, a clear on your initial run effectively impossible. Plus it also has a particular fondness, on the levels which are multiple screens high, for giving you a lot of blind jumps and no way to see what’s under you. It’s a memory game beyond all else, for better or worse. While painstakingly practiced play will have you leaping around and stylishly busting whole groups of enemies before they have a chance to react, the neophyte would not be remiss in thinking that this game has a tendency to push complete bunk on you. And then the labyrinth stage. Since Super Mario Bros. 1’s final level, mazes have been a time-tested method of giving the last stage just a bit of extra kick-in-the-pants. And, ever since then, final level mazes have been awful and infuriating. It’s not particularly hard, and it’s devoid of the instant death of previous stages – but this is actually to its detriment; it replaces brutal, relentless, unforgiving action with dull confusion and travelling the same corridors five or six or ten times. The game doesn’t fizzle out with this – the last boss battle is, as mentioned, completely excellent. But it’s probably the most glaring blemish on an otherwise superb game. But those are, in consideringhow much this game gets right, minor complaints. It’s a brilliant game. It’s the first game I can see as justifiably making people want a Sega Genesis, and one of the first games to really show off the potential of the new generation of video game consoles. 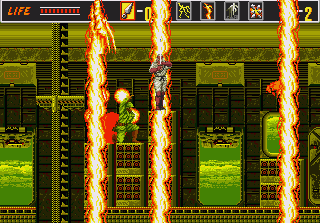 Unlike most of the Genesis’ library before it, it is emphatically not just an arcade port but rather an action game uniquely suited to its home format. It’s a game of which it’s difficulty will constantly, frustratingly, stymie your attempts to master it, but its solid gameplay and constant inventiveness will keep you coming back for another try. Sonic may be the symbol of Sega’s ascendance in the home game arena, but this game – Revenge of Shinobi – is the real turning point for this system. This entry was posted in Platformer, Winter 1989. Bookmark the permalink. So accurate, I couldn’t have written a better review myself. Absolutely spot on. To this day, I still fire up TRoS because it’s so bloody *satisfying* to play. Perfectly paced, beautiful locales, fantastic music. I remember trading my NES and my _entire game library_ for a month to borrow my friend’s Genesis and TRoS I was so in love with it. I played Revenge of Shinobi when I was a kid. The game is definitely one of the best ever made! Great post. Revenge of Shinobi *was* the showcase game for the Genesis for 1990 — gorgeous and entrancing. Unfortunately, my Genesis ownership didn’t start until 1992, and I didn’t actually play this game (as opposed to absorbing the spectacle in a department store) until the age of emulation, when I’d already had several years of Shinobi III under my belt. It’s difficult going back. The later game makes even better use of the Genesis’ strengths, and — more damningly for its predecessor — it removes the stiffness in Shinobi’s control and movement that occasionally makes this game a controller-rending pit of frustration.